By Bud, March 3 in Communications: Mail Services, Print / Electronic Media, Internet, etc. I've recently been noticing faster Internet speeds, and so started measuring performance. Note that we have two ISPs because we run CL and depend heavily on the Internet for both CL and our business needs, which includes commercial VoIP telephone service out of the US. 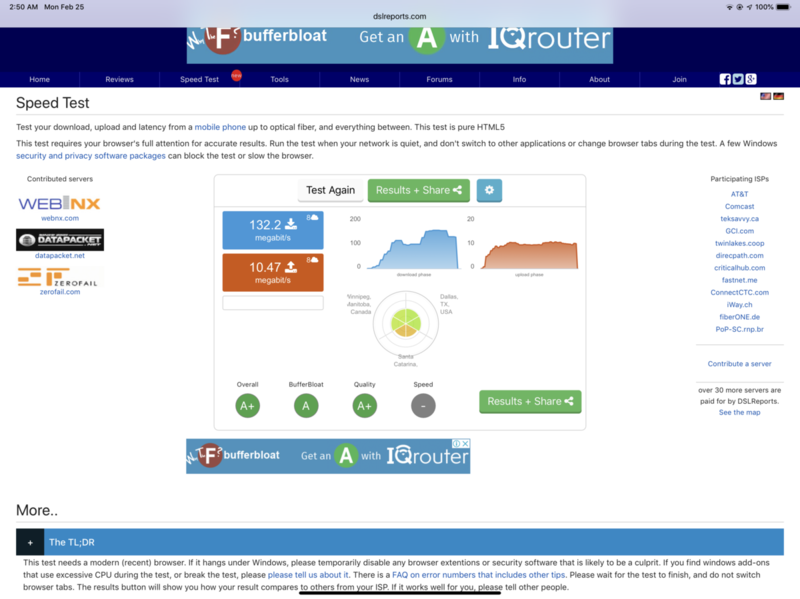 Because of our dependence on the Internet we have a "high end" network setup that includes industrial grade networking components by Peplink that includes a gateway router that supports up to three WAN connections, and which shifts between our two ISPs based on measured performance of our two WANs. The router does not combine the bandwidth of the connected WANs, but only switches between them. We also use four 8-port Peplink Ethernet switches. We pay for 30Mb download and 5Mb upload on our main CableOnda account. To my surprise we frequently get 150+Mb downloads and 10+Mb uploads. As broadband technology (meaning sharing of bandwidth among the users), CableOnda does tend to be faster in the morning hours (especially the wee morning hours) and then slowing down during the evening hours, presumably when a lot of people are watching Netflix type multimedia. 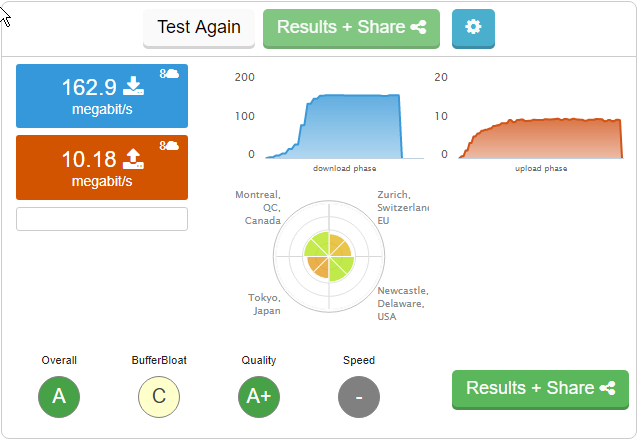 We use two network performance monitor applications: Speedtest.net and DSLReports.com, both of which are free. I actually prefer DSLReports because it seems to be more realistic (personal opinion) by simultaneously testing multiple ping servers around the world. Here are some screen shots showing our recent network performance. Being a curious type person, I started asking friends about their experiences with their ISPs. And then we also get [unsolicited] feedback from some CL members who have difficulty accessing our website. Two general themes are presenting themselves in this feedback. One theme is that "the word" is that CableOnda is upgrading its Internet infrastructure and increasing speeds for customers, but doing so without announcing these improvements. That statement is something that we are hearing and I cannot attest to its authenticity. But if true, it would explain what we are beginning to experience. 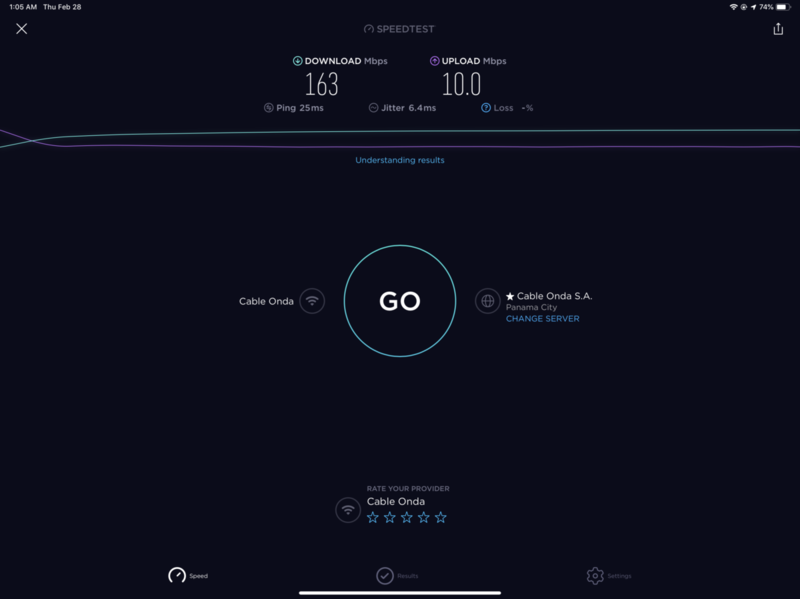 The second theme from the feedback is that there are some areas of the Chiriqui highlands that have very poor performance with CableOnda as their ISP, and in some cases not able to get service at all. Two areas of poor service in general are the Brisas Boqueteña area including further south approaching Los Molinos, and the other area is parts of Potrerillos; we don't have many data points in the Palmira area, but suspect a similar scenario as those in the Potrerillos area. Some people in the Brisas area say they go several days at a time with either painfully show or no service, which has to be a major ouch for them. And some people say they cannot even get CableOnda service even though nearby neighbors have it, and in one case a situation where there is literally a neighbor on either side of their home having CableOnda service, but unable to get it for themselves. Have no idea what that is about. The above two paragraphs are anecdotal in nature, as I have not done any rigorous research, nor do I intend to do such. The primary reason for posting this information is to see what others have to say about their ISPs. 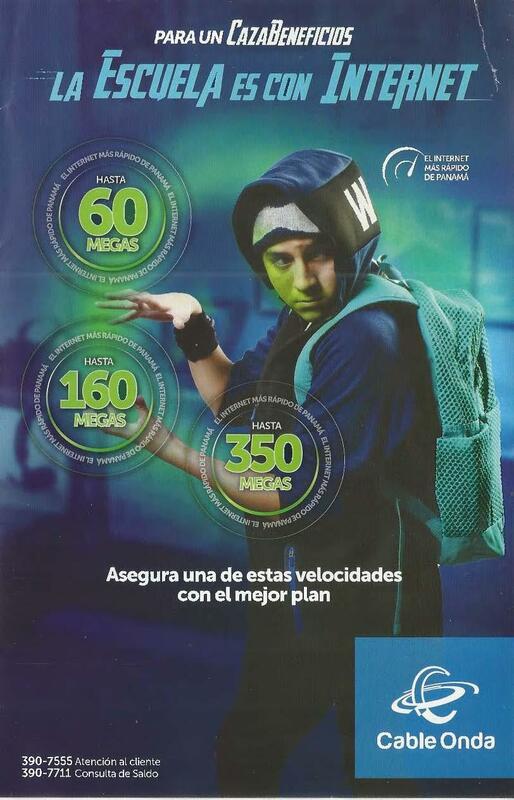 And one footnote, I have been told by two people that CableOnda may be reducing their Internet rates, but not sending out notices to the customers, nor automatically reducing the bills. Those two people have indicated they learned about the rate reductions while at CableOnda in David. They learned they could request a rate reduction (which they did, and apparently successfully with no complaints). I don't plan on making a special trip to David, but will stop by to inquire about rate structure changes the next time I am in David. I've experienced the same over the last couple of years with Cable Onda. They have in fact reduced their rates but in lieu of lowering your monthly bill they increase your speed. I subscribed to their 30 meg service three years ago and twice they've increased my rate to 60 meg and then to 100 meg without notification or changing my monthly bill. I'm a retired EE with CCIE and MCSE certifications (both long expired), I must say you've got a nice network. 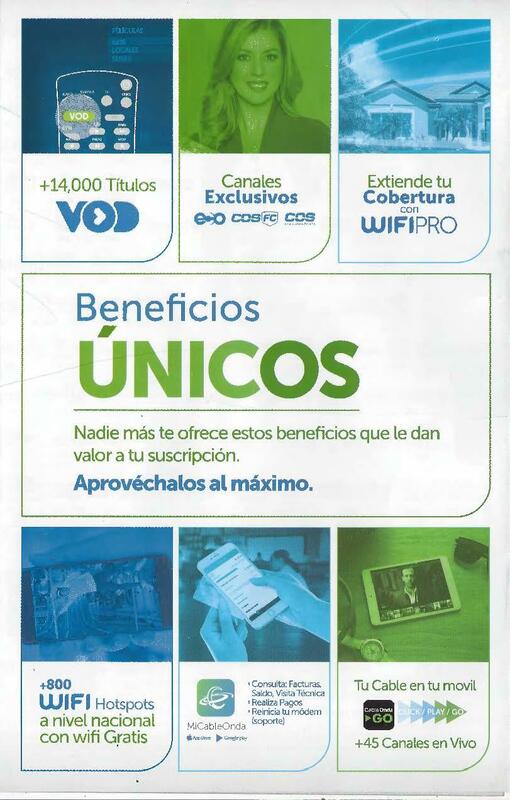 Attached are Cable Onda's rates as of January. Yes we are experiencing fluctuations (higher speed). Usually in the mornings. No consistency in the increased speed during the peek hours. So, it is actually not in favor of the customers. I will continue to believe band width is the main problem. Maybe Cabla Onda can support new technology that increases the size of compression packets of data one day------They are not replacing the fiber optics in the area with more band width at this time. We have 30mg and some people have 60, 100. For all three speeds during peek hours the speed is the same. I have to remember where we are! And us country folk are stuck with 4-6 mega for $90. Ah well, I like the Country. We signed up with Cable Onda 5 years ago and I think their top speed at that time was 15 Mbps. Like others, the speed has increased considerably over time (15 to 30 to 60 to 100 to 160 Mbps). 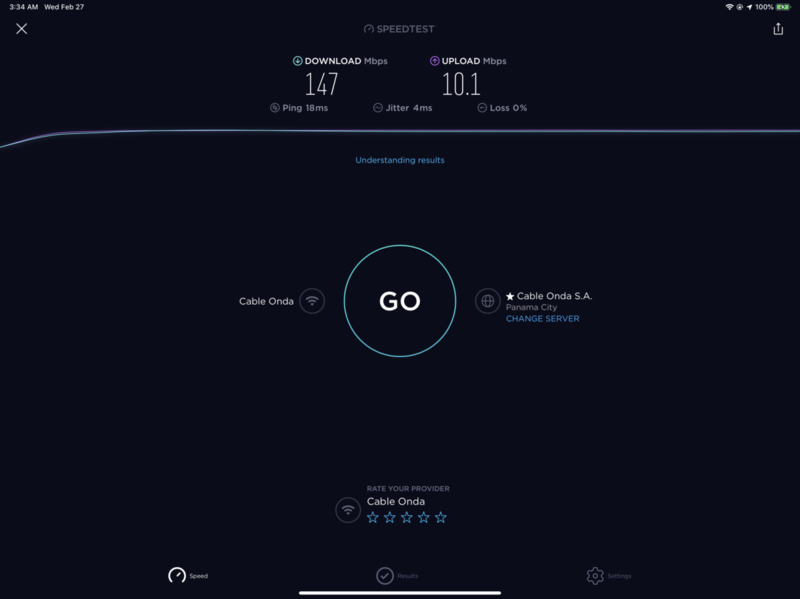 I find SpeedTest's "Finding optimal server" process sub-optimal because it always finds a sever in Costa Rica instead of Cable Onda's server in Panama City. The screen shots below show the difference which can be considerable especially the Ping times. The problem in Potrerillos appears to be a full spectrum on the El Banco repeater. Friends of mine tried to get service but was told it is not available. When I was with them, my minimal 4meg would slow considerably at times of heavy use. I tried to move up to a blazing 6meg, they took my money but never provided the increased speed. Again, the excuse was no extra bandwidth at El Banco. The problem in Potrerillos appears to be a full spectrum on the El Banco repeater. Pardon my ignorance, but not sure what "full spectrum" means. Are you saying the Cableonda equipment is out of bandwidth and can't support more users? My apologies for not being clearer. Yes, they are out of bandwidth, perhaps things have changed in the last couple of months but I don't think wireless is a priority for them. Yes, our account (and by inference all/most CableOnda Internet customers) are getting bandwidth upgrades. Our account now is 160Mb downloads and 10Mb uploads. Again, we are heavily dependent on the Internet, and so we did not downgrade anything here. 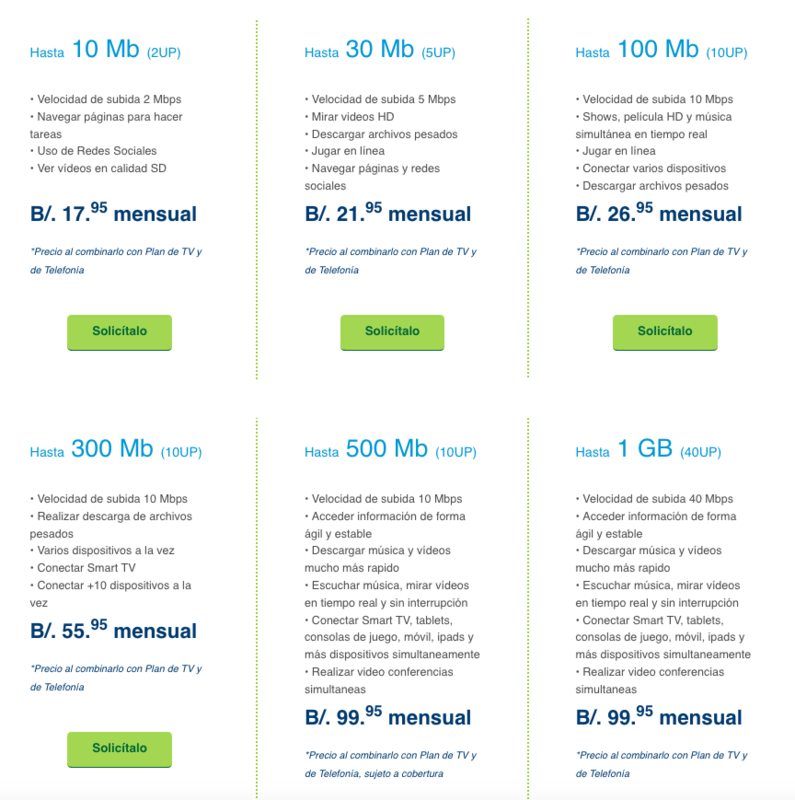 There are other Internet plans at different billing rates, one lower (60 down, 5 up) and two higher (350 down, 10 up; 600 down, 10up). 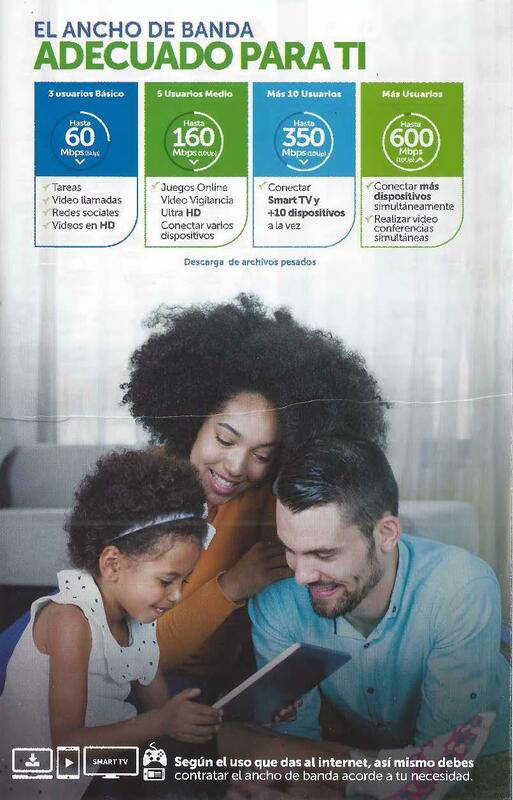 Yes, there are ways to reduce a monthly bill, and ours will be going down about $8.00 monthly, but that is because of changes in our television channel selections, and having nothing to do with Internet service or our home telephone (which is serviced by CableOnda). BTW, the CableOnda office was quite busy, but as jubilados our wait time was only about 20 minutes. The agent who helped us spoke no English, but my Spanglish was more than adequate with one exception, at which time the agent asked her neighbor agent to assist with translations. (The translation was needed because of the complexity of conveying the idea that our account is in the middle of a billing cycle, and she was trying to tell me that the rate reduction is not pro-rated, but will become effective with our next billing cycle.) It was a very nice experience in terms of customer service, and for us it was counted as a successful visit. 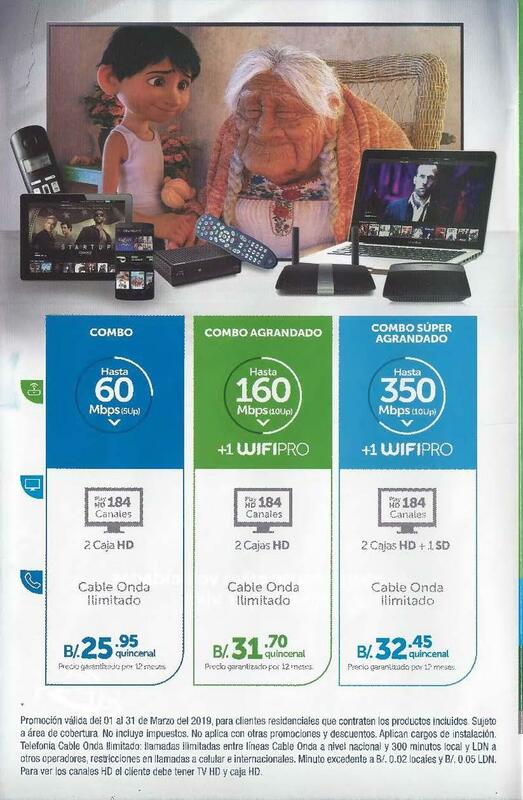 Here are scans of one of the CableOnda marketing brochures in case you want more details. Note that the prices for the service are "quincenal" meaning every 15 days, so you have to double it to see what you would pay per month. Ahh the subtleties of marketing!! Many payments for loans or services are structured on a 15 day basis in order to coincide with paydays on the 15th and 30th. Another update on the increased Internet speed topic that I recently started.I have been routinely monitoring the download and upload speeds. Seems to be consistent at about 145+MB down (sometimes ~180MB) and 9.5MB upload ). There is an occasional blip in both speeds, but a follow up measurement within a minute shows things back to normal, meaning 145+ and 9.5. I’m a happy camper with my CabeOnda service. .